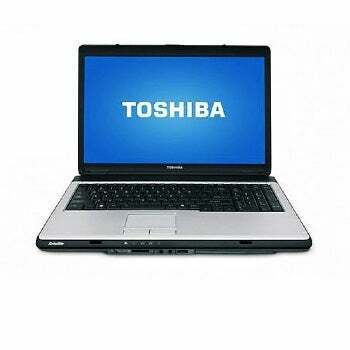 A brand spanking new, full-blooded, big-boned 17-inch Toshiba laptop for $348. That got your attention? Same here. When someone from Wal-Mart told me that a desktop replacement machine (selling for less than many netbooks--including Toshiba's own NB205-310) goes on sale this Sunday, I figured you might want to know. 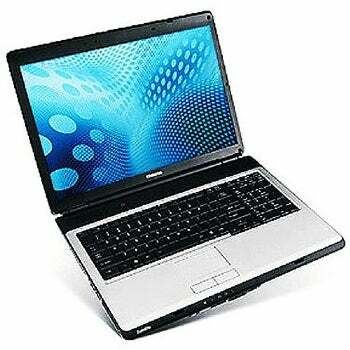 · 17.0-inch diagonal widescreen TruBrite LCD. 1440 by 900 resolution (WXGA ) and native support for 720p content. Mobile Intel Graphics Media Accelerator 4500M with 128MB to 1342MB of dynamically allocated shared graphics memory. Translation: It doesn't have a discrete GPU for great graphics performance, but do you really expect to get everything for this cheap a price? This is the biggest, most obvious corner to cut. It is also the most potentially tricky element considering this notebook has a huge screen highlighting a weak GPU. · Intel Celeron 900 processor, 2.2GHz, 800MHz FSB, 1MB cache. Well, apparently someone found a hidden stash of decent--but dated--CPUs. · 3GB shared dual-channel DDR2 SDRAM at 800MHz, expandable to 4GB. Hint: You'll want to upgrade to 4GB at some point...when you buy Windows 7 for this thing. · 250GB SATA hard drive. Not too shabby, but I don't know the HDD speed. · CD/DVD SuperMulti Drive (DVD+/-RW). Honestly, not too bad with all the trimmings here. With the exception of the optical drive and the ExpressCard slot this is the kind of layout you'd find in netbooks. In short, if you have simple needs, this thing screams "BUY ME!" just going by the stats. Fortunately, an early review unit of the L355 just showed up in our labs, and we are hoping to give you a more detailed heads-up before it goes on sale this weekend. Here's something to ponder for now, though: Best Buy drums out exclusive machines geared to schoolkids with seemingly reasonable prices in the $650 to $800 range. We just looked at a couple of those Best Buy notebooks to see how good they really were. But Wal-Mart is knocking on Best Buy's door by potentially out-muscling the electronics chain with ridiculous deals like this one. And it also might start making you reconsider even buying a netbook in the first place. "Why buy a $400 netbook that doesn't even have an optical drive when I can get a full-fledged 17-inch laptop for less?" Let's just say that the race for your electronics dollars is about to get mighty interesting. I'll try to get another update posted before the weekend, but just in case, the unit should be available August 16, 12:01 a.m. Eastern Standard Time. You know, if you think to order laptops on a Saturday night.